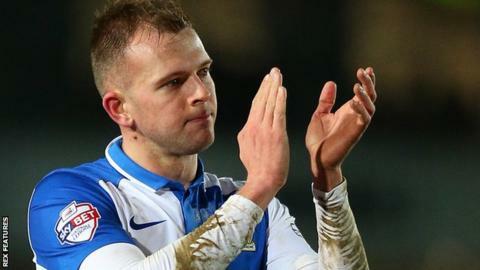 Middlesbrough have signed striker Jordan Rhodes from Blackburn Rovers for an initial fee of £9m. Leicester defender Ritchie de Laet, 27, has also joined Boro, agreeing a loan move for the rest of the season. And Belgium Under-21 midfielder Julien de Sart, 21, has arrived from Standard Liege on a three-and-a-half-year deal. Rhodes, 25, has signed a four-and-a-half-year contract with the Teessiders, who are currently second in the Championship, a point behind Hull. He has scored 166 goals in 316 career league games and netted 11 in 26 matches so far for Rovers this term. He is also the leading scorer in the top four divisions of English football since August 2012 with 85 goals - 14 more than second-placed Charlie Austin (71). His signing comes less than 24 hours after Boro confirmed a deal to sign the Scotland international had collapsed. Middlesbrough play Blackburn at home on Saturday. Belgium international De Laet has made 15 appearances for Premier League leaders Leicester this season.